QUARTER TURN QUICK TEE -- JET SNAP ON CAPS. BOOMS DOUBLE PLUMBED. WIDE SPACING TURBO FLOODS FOR PRE-EMERGE WORK & LARGER TIPS AVAILABLE FOR TOP DRESSING NITROGEN ON WHEAT. 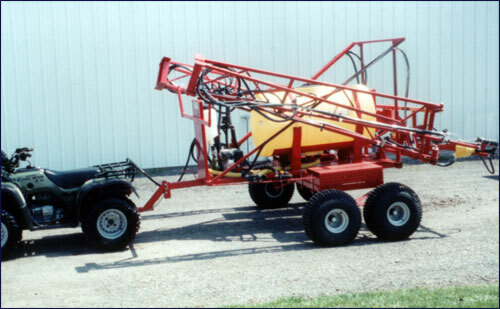 TURBO FLOOD TIPS ARE AIMED AT TARGET AT A 45 DEGREE ANGLE FOR RESIDUE PENETRATION. 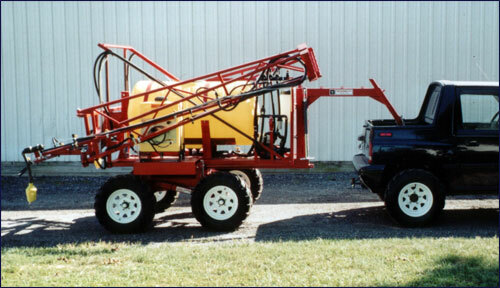 BEAN BLASTER, TWIN JET TIPS, SPRAYS TWO FLAT FAN PATTERNS, ONE 30 DEGREES FORWARD ONE 30 DEGREES BACKWARDS FOR DOUBLE COVERAGE 110 DEGREE ANGLE TIP FOR 100% OVERLAP RESULTS IN FOUR ANGLES OF ATTACK ON 30" CENTERS, UNBELIEVABLE COVERAGE MAKES THE BEAN BLASTER EXCELLENT FOR ALL POST PRODUCTS, FOLIAR FEED & BURN DOWN. QUICK CHANGE BETWEEN FLOOD AND BEAN BLASTER. QUICK JET STAINLESS TOPS.